I have read a lot of parenting books aimed at men as I review parenting books and my husband received quite a few as gifts in the run up to having our kids. Most were very ‘laddy,’ matey and big on jokes. Whilst this may have helped some dads relate to the author my hubby seemed to just be reading me out jokes rather then leanring much from what he was reading. He soon got bored (not before me though!) I so wanted him to understand what was happening and you know what, he did too. Lots of men genuinely do want to know they don’t want a joke book they want a book about becoming a dad. That is exactly what Tim has written. 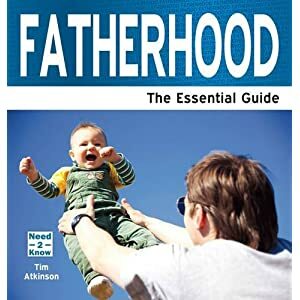 There was a real gap in the market for Fatherhood – The Essential Guide and whilst its too late for us, for all dads-to-be out there I’m so glad this has been written. Tim Atkinson is a stay at home dad and was last year voted the TOP parenting blogger in the UK. He certainly knows a thing or two about parenting. His style is clear, simple and direct. How absolutely refreshing. Fatherhood spans planning a family, through the pregnancy, birth, the first few years and financial and benefits advice. It is o useful, really informative and succinct. It contains lots of examples from real dads and a great summing up list at the end of each chapter. This book is bang up to date and really dad focussed which is wonderful and will really encourage dads to be fully involved. But it also shows a respect for women and what they go through during the birth and beyond and this is fabulous. A parenitng book for grown up men and those that really want to be present, enagaged dads and supportive understanding partners. If you know a dad-to-be this is the best gift you could give him and absolutely perfect for Fathers Day. Tim blogs at Bringing up Charlie on all aspects of being a dad and it is also a right good read! I have met Tim a couple of times now and he seems to be a lovely chap, funny, big hearted and a man who cares passionately about being a good dad. He is definately well worth reading. Previous Post Credit Made Clearer Competition Could Win You a £30 iTunes voucher! I love this idea and you are right Tim has a lot of experience and is very knowledgeable about life in general as well as fatherhood. I think this is a fab book to buy new parents and will be seeking it out for friends. Thanks so much for this very generous, kind and – of course – entirely accurate(!) review Becky – much appreciated!